The Black Onyx is huge on a historical level; absolutely massive. I may overstate the importance of this title, but it could be argued that it laid the foundation for the very concept of the JRPG, or at least the dungeon crawler in Japan. As the story goes, the author was a fan of Wizardry and Ultima, but couldn't find similar titles during a prolonged stay in Japan, so he wrote his own for the PC-88. From there it took off, and claimed a place in history for being one of the first (or maybe the first) successful RPG in Japan. I'd been wanting to give it a play ever since I read about it on The CRPG Addict's blog but I could never find a good time to do it. It seemed like it'd be a boring watch on stream, and I always had other gaming projects going on in my free time; not to mention work and life stuff. I decided to do it between Might & Magic III and Xeen (the former of which I have a write-up on coming soon). It only took me about a day to finish it, but wow are there some... concepts... here. Let's start with this: The Black Onyx is probably the most simplistic and austere RPG I've ever played. You make a party of five generic mooks that has no concept of class and barely even stats. They can only attack, not use magic, not use items in battle... So they're effectively all Fighters. Battles come down to bopping each other until one group dies, or flees, as enemies tend to do more often than just being wiped out. There's no inventory; when you buy equipment, the prior item is simply discarded. Healing is done with "drugs" that each fighter can carry five of at a time. When you run out of drugs, it's time to start walking back to the surface. Yup walking, no quick travel here-- though there is a shortcut you can unlock about two thirds of the way through the game. There's no dialogue, no hints written on walls. 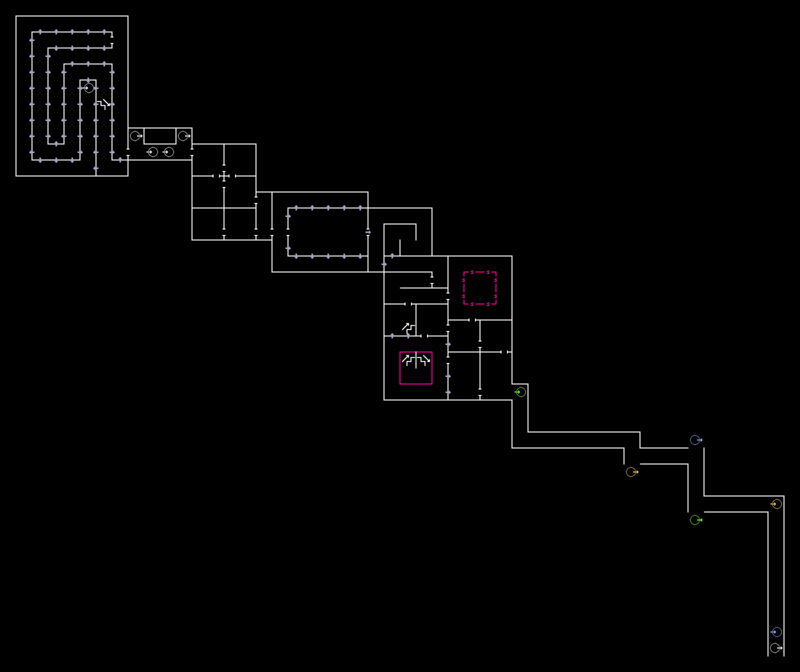 All you have in the dungeon to find your way around is graph paper (or a mapping program) and your wits. Given this, some of the mapping is pretty brutal. For one: in this era of dungeon crawlers, memory space was at a premium. Most developers crammed 16x16, 24x24, or 32x32 grids 100% full of traversible space. Based on this you could make certain assumptions about the shape of levels, which in turn could let you detect things like warps, loops, and such. Not so with The Black Onyx. I would describe most of these levels as "Out of control" with massive sprawling hallways, bounds-violating diversions, and some pretty cruel teleporter loops that took me 3 or 4 laps before I finally realized I was in a loop. All the while, increasingly out of band enemies are chewing on your limited resources. One of The Black Onyx's favorite tricks are one-way invisible walls, which I've never seen used in the way this game does. The north-west corner of the map above is a good example: all of those walls are invisible and passable from one way but not the other. As you approach the stairs, you're wandering in what looks like a huge empty room, but if you step off the one-tile path, you're suddenly locked into the relief space and have to go around and try again. This is one of the tamer uses of this gimmick. Start-up was a little rough, as is normal for most dungeon crawlers. Once you get a piece of gear or two and a level, though, you're pretty safe in the early dungeon rooms. From there, gear upgrades and levels keep you pretty much dead on par with the dungeon content (presuming you have to explore to find your way) until the 4th floor. Here, the upgrades dry up, and levels start taking longer to get. After a few initial deaths getting started, I basically blitzed to B4F where I immediately encountered my first party wipe since I reached level 2. Around the 4th or 5th floor, you'll get the best gear in the game, and it still won't be enough, so it's grind time. These colored sections are colored similarly in-game (to an eye-searing six-color degree). Once you map the floor out, which is easier said than done thanks to the looping edges. you're supposed to move through this maze in a specific pattern. Touching the right sections in order unlocks the purple doors in the south-east, giving you access to the staircase that takes you to the final leg of the game. One problem though: there's no clue what the right order is. The closest thing to a hint is a random note shoved off in the far corner of town: "...how the colors change...". It's the only "note" in the game, and hence raises itself as extremely important, but what are the chances you'll remember it here; let alone know what it's talking about? What it's referring to is the title screen. 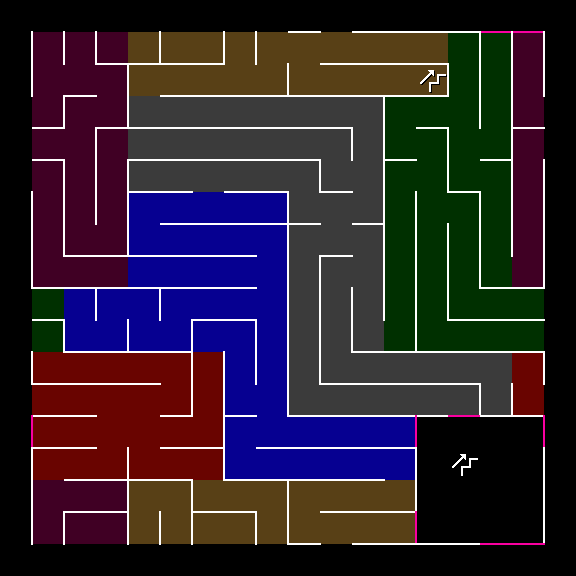 Once the intro music begins, the logo begins rotating through six colors; the same six colors seen in the maze. That's the solution. With that in hand, you then have to route a path that takes you through those six colored regions on B6F without touching any color out of order. Once that's done, the game beeps (even if you have the sound off; that scared the heck out of me), and the doors to the room in the south east open. 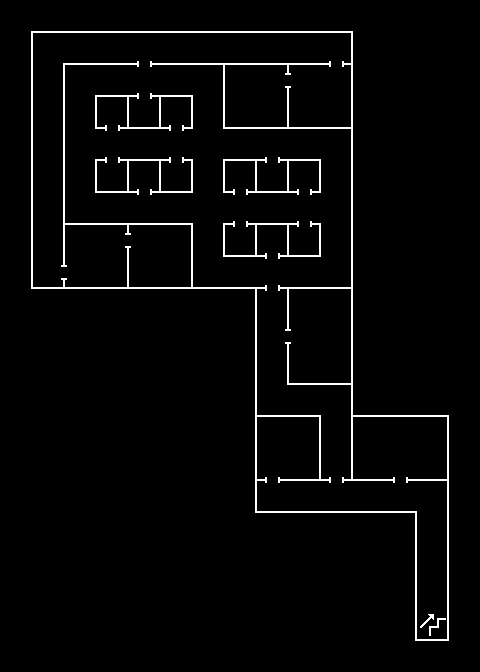 Inside is a staircase that takes you inside a 2x2 black walled spire that stabs through the entire dungeon, and this takes you all the way back up to the surface, and yet one more floor to a floor "minus one". This is also where The Black Onyx throws out one of the meanest tricks I've seen in a dungeon crawler since the Wizardry softlock room: the spire is one-way walls. From inside, you cannot see the bounds of the spire, and by design you cannot see the next set of stairs to take you up toward the surface. Since stairs also don't align between floors, this turns into a guessing game: do you walk left from the stairs, or right, to reach the next floor? If you guess wrong, you're kicked out of the spire and must return to B6F, re-do the color puzzle, and try again. I abused save states; thank you. So upon getting through the spire and reaching floor "minus one", things somehow get meaner. The final floor is a 16x16 grid of blank space, dotted very seldomly with one-way invisible walls and packed with encounters that can one-shot your party members; or at least mine. If you get lost, orienting yourself is almost impossible as most of the walls simply don't appear unless you look at them from a specific direction. Somewhere in this grid the Onyx is just sitting, and when you walk onto the tile, the game beeps and informs you that you've won. Where it is or how you get there? I have no god-forsaken clue. I ran around like a chicken with my head cut off until I found it, following a failed attempt to map this grid that came to the conclusion that the blank open space also contains silent teleporters and/or spinners. Augh! When you flee, you move 1 to 3 spaces in that random direction. There's no smooth turning to tell you which way you turned, and the steps are instantaneous. So if you flee, you've now gotten lost, with almost no way to re-sync yourself. 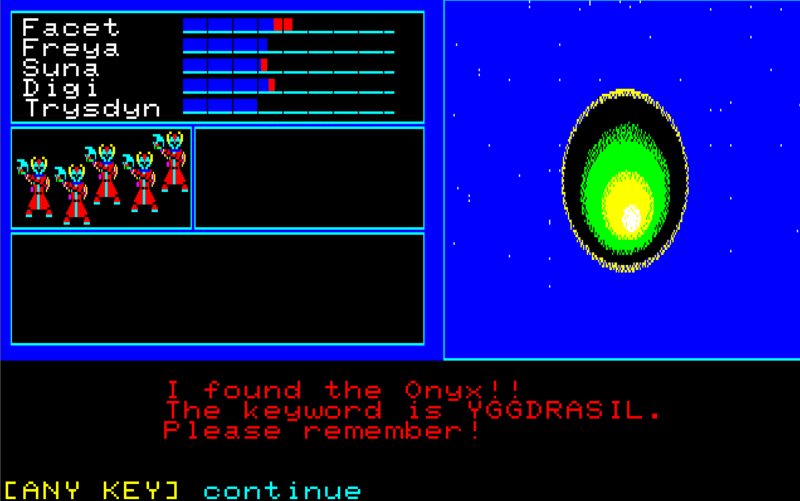 Your reward for finding the Onyx is a password, presumably for some contest the developers or publishers had going on? Also two levels for everyone in your party. Whoop de do. You're left in the final area to navigate back to the stairs and emerge from the black spire in town, where... absolutely no one realizes you found the Onyx. NPCs still wish you good luck on your quest, nothing has changed. From here I guess you can just finish your maps and grind, but the game is over. In the end The Black Onyx is groundbreaking, not just because of its timing, but also because of the creativity the developers showed in the dungeon design and working with the limitations of the system. It's mean; really mean... but it's mean in a unique and interesting way that at least kept me interested until the point of no return at the end, where I finished it mostly out of spite.